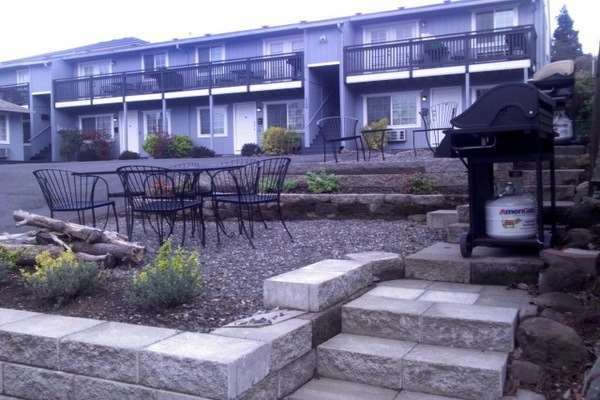 The Hood River Suites and Extended Stay Apartments feature nine modern 1-bedroom apartment suites for short or extended stay. All rooms have a separate bedroom with King bed, full size kitchen, spacious living room with pull out sofa bed, dining area, bathroom with tub and shower, patios, and BBQ area. Great downtown location to walk to restaurants, pubs, shops and more! Perfect for vacation or extended stay travelers, nurses, Insitu training, and relocation. Bingen and White Salmon, WA are a 5-mile drive. The Dalles is a 20 min drive. Close to Insitu.